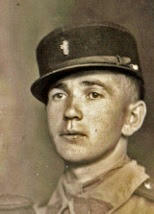 Josef Kalaś was born in Czechoslovakia and served in the Czech army before the outbreak of WW2. During the 3rd Reich Occupation, he fled via Poland and joined the French Foreign Legion. He was released to fight with his countrymen at the outbreak of war, and eventually, having survived the last battle to stem the German advance on Paris, Josef arrived in England. He served as a Sergeant with the 1st Battalion at Moreton Paddox where he shared accommodation with Jan Kubis and Josef Gabcik, the two men who carried out the assassination of Reinhard Heydrich in 1942. Football played a major role in the lives of the Czech during their time in Britain, and Josef’s diary , written for the benefit of his family, in the event of his death during the war, recorded his representing the Czech Army a number of times, against local clubs at the Windmill Ground Tachbrook Road, and against Midland First Division sides, Wolves, West Bromwich, Birmingham and Leicester City. His side also played against teams representing the Dutch, French, Norwegian, Polish and Belgian armies-in-exile. The diary also records his experience of life in wartime Leamington, – not as bleak as one might have supposed. Josef was something of a charmer, and although he struggled sometimes with English, he had no difficulty at all in making assignations with a whole string of local girls, – until he started going steady with his future wife, Leamington born Joan Garrett. Josef was also witness to the eventful night of 14th November, the night of the First Coventry Blitz. He recorded the anti-aircraft fire starting up at 8pm, with damage to roofs all around, the sound of bombs being dropped “not far from us”. Windows rattled, roof tiles fell. There were rockets and other missiles fired, all amidst the most unbearable noise. It was not until the following morning that the death toll and building damage became known, but in the meantime, Josef’s comrades-in-arms had been actively involved in clearing the rubble, some in Leamington as part of the Ambulance Brigade, and some in Coventry, where overnight the bombing had resulted in 200 dead and 800 wounded, – with worse to come. Josef Kalaś and Joan Garrett married in 1943 and at the end of the War, they moved to Czechoslovakia, but although Joan made every effort to learn the language, she found it difficult to settle. They came back to Leamington and eventually set up home in Kinross Road Lillington, but only after Anthony Eden spoke on Josef’s behalf in Parliament: Josef was the first foreign person to attempt to settle here after the war. Josef died in August 2008, having shared reminiscences of his long life over many cups of tea with local historian Alan Griffin. Both he and Joan, who died aged 78 in 1999, are buried in the ‘new’ churchyard at St Mary Magdalene, Lillington.